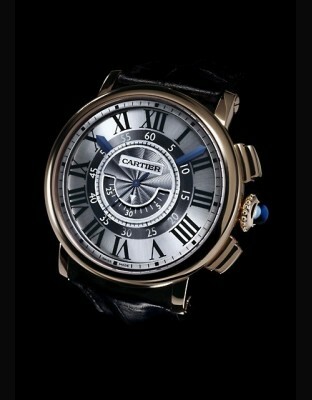 2009 represents a real quantum leap for Cartier. For the very first time, Cartier is developing its own watch movements that reflect the brand’s intense and ambitious research into mechanisms. 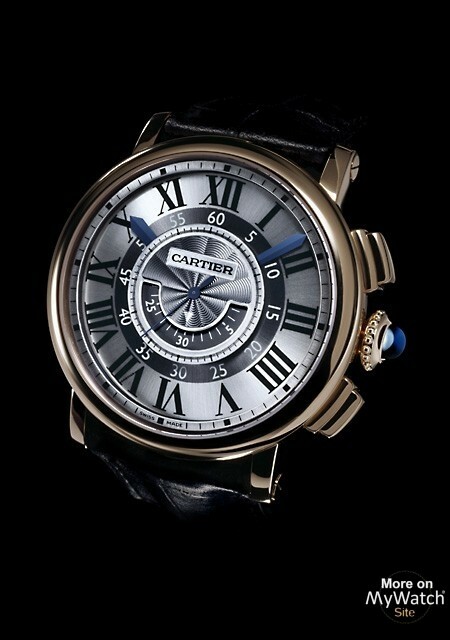 This remarkable foray into the world of calibres is the signature of a new approach to fine watchmaking by Cartier, which was inaugurated last year with the Ballon bleu de Cartier Flying Tourbillon timepiece. 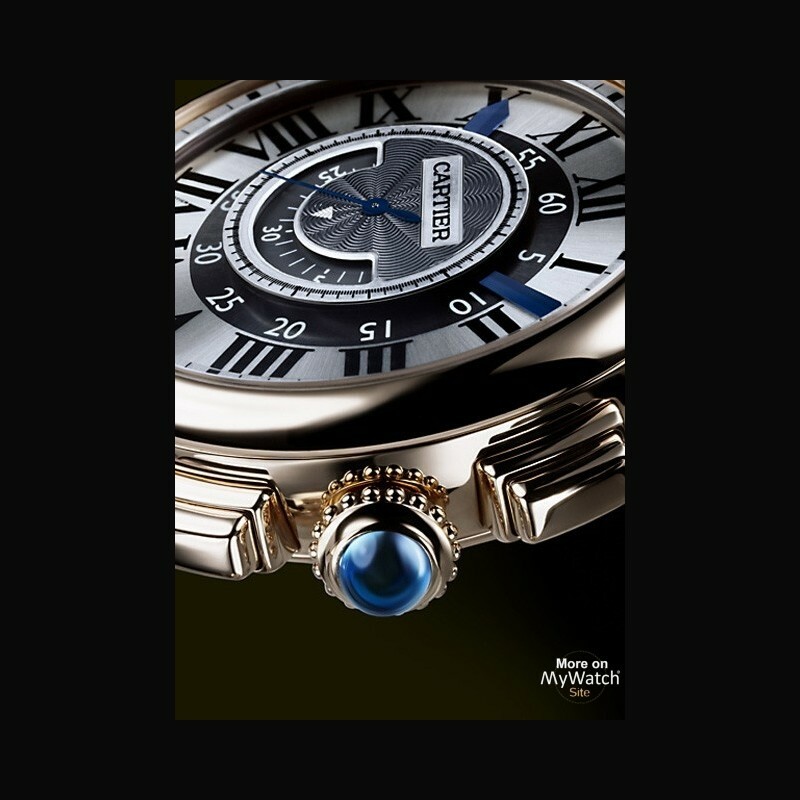 Cartier has developed an array of shapes to convey this dynamic impetus, expressed in both the cases of their watches and the movements themselves. 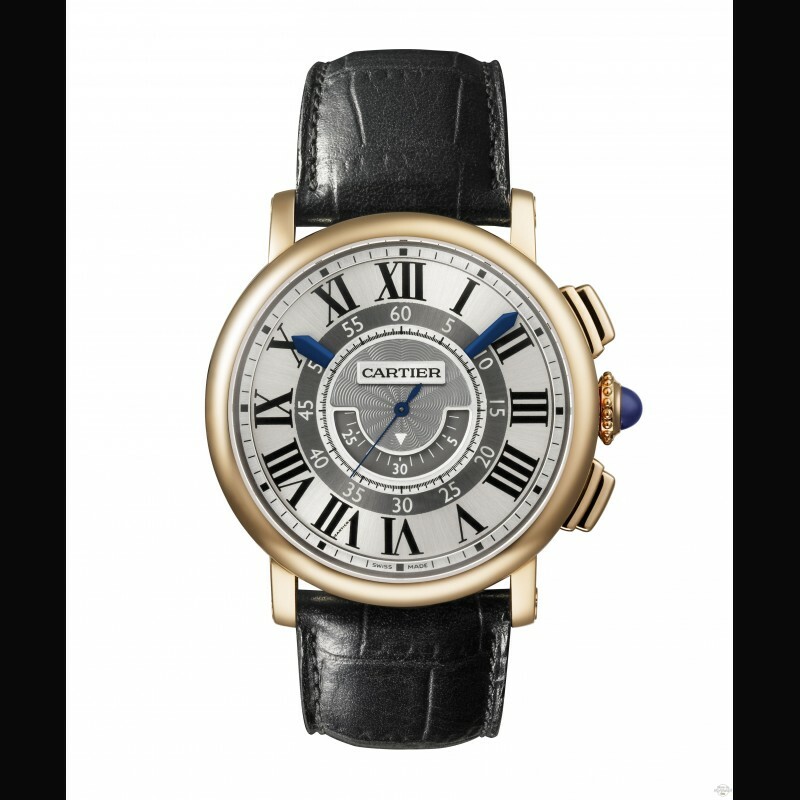 Featuring striking silhouettes, inventive graphic designs, spectacular volumes and Cartier-made movements, some bearing the prestigious Geneva Seal, this collection of ten timepieces elevates great Cartier classics – from the Tank Américaine to the Santos 100 – to the rank of authentic examples of fine watchmaking. With this new 9907 MC calibre, produced, developed and prototyped exclusively in-house in La Chaux-de-Fonds, Cartier is revisiting the chronograph function through this pioneering version of the Rotonde de Cartier model. The primary distinguishing feature of this new Rotonde de Cartier 9907 MC calibre watch is the isolated chronograph display in the centre of the dial. This ingenious arrangement offers both exceptional legibility of this traditional complication and a novel way of displaying the time. Timekeeping occurs on two levels: the lower level is devoted to displaying the hours and minutes using blued hands which are invisible save for the tips, while the upper level is dedicated to the chronograph function. In the centre, the slim blued seconds hand begins to move when the corresponding push-piece is pressed, while the large counter in the form of an arc records each of its revolutions up to thirty minutes. Thus, the hands indicating the time never obscure those of the chronograph. The central chronograph counter is held as if weightless above the dial by a sapphire ring, whose discreet presence adds to the complexity of this construction, for which a patent request has been registered. The 9907 MC calibre is equipped with a complex transmission system for the chronograph function. 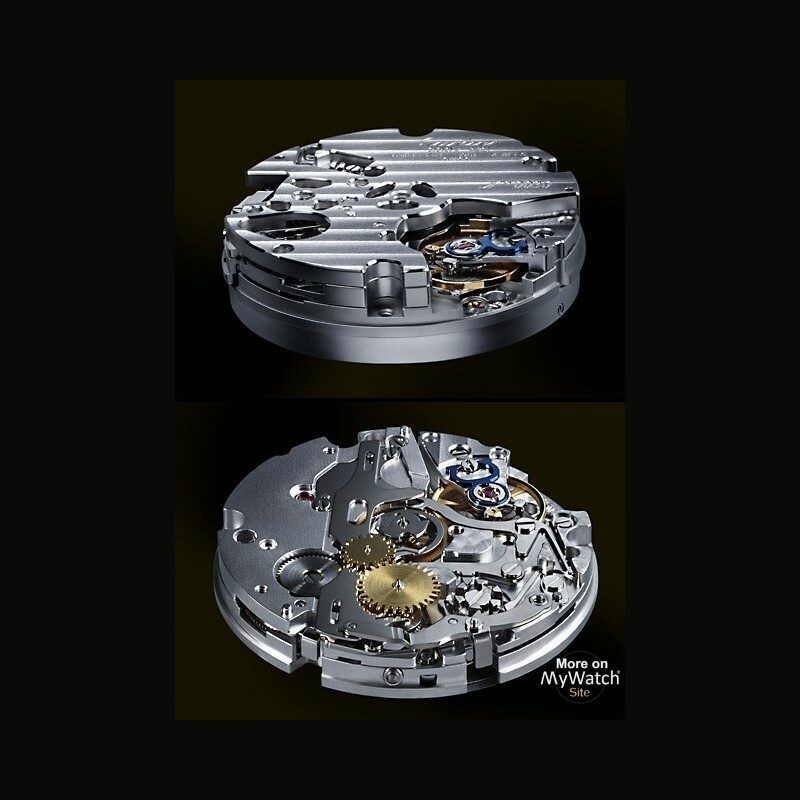 In fact, a column wheel controls the three chronograph functions (start, stop and reset), whereas in the majority of chronographs, this wheel is replaced by a cam system. The design of the 9907 MC calibre with manual winding also involves a smaller number of components than usual. In total, the Cartier watchmakers manufacture and assemble 272 parts. This reduction offers both improved watch maintenance and better long-term endurance. With a diameter of 11 ½ lines, i.e. 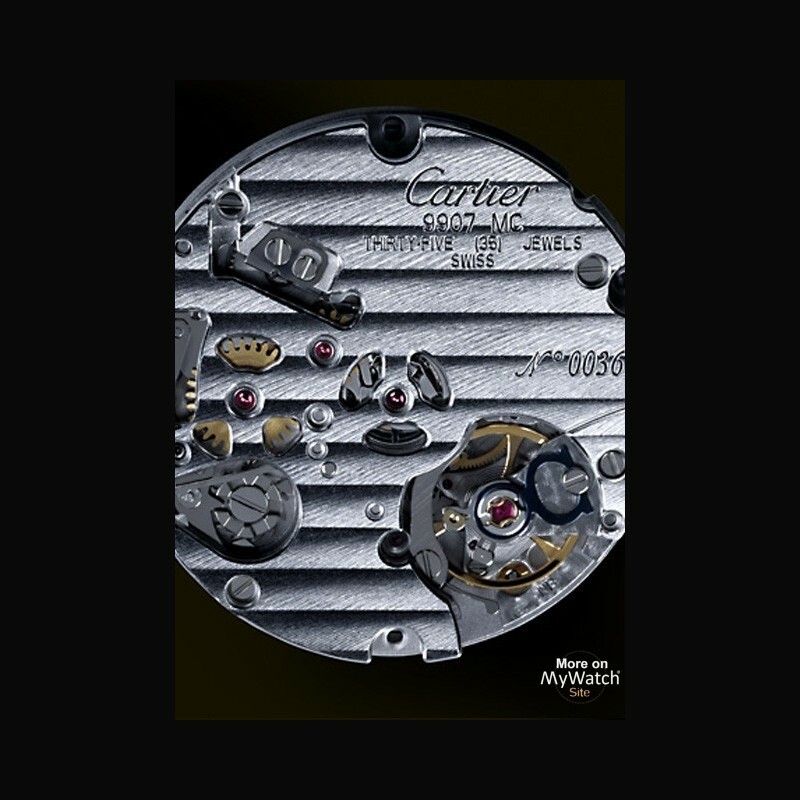 25.6 millimetres, and a height limited to 7.10 millimetres, the Cartier 9907 MC calibre has an exceptional capacity to integrate all functional elements in a relatively limited space. The 9907 MC calibre is establishing itself as a truly innovative movement thanks to a vertical coupling system. In fact, the Cartier watchmakers decided to substitute the usual horizontal release system mounted on a lateral yoke, which requires a large amount of energy, for a vertical alternative with an extremely modern design. We are thus moving from a gear-train mechanism to one that works with friction. Analogous to the clutch system of a car, this system works by adherence, or in other words, by reciprocal pressure that is controlled very precisely by two small disks. Designed to reduce the energy consumption of the chronograph function, this vertical coupling system conserves exceptional chronometric precision despite the addition of a supplementary function. • It renders the usual braking and blocking levers, used to keep the various elements of the chronograph display in position after measurement, superfluous. • It allows the chronograph hand to advance smoothly from the very beginning of time measurement and to move with perfect regularity according to the rhythm dictated by the vibrations of the balance, i.e. in eight little steps per second on the 9907 MC calibre. The precision of the chronometric function is thus improved. • Activating or deactivating the chronograph only has a very marginal effect on the amplitude of the balance. Such an original function thus enables Cartier to forgo the small seconds. The control is then assured by the chronograph hand, which can remain permanently in motion. With a circular case in pink gold, rounded flanks and pronounced curves, the Rotonde de Cartier chronograph lends its 42 mm diameter to the graphical rigour of a dial on two levels. • All of its steel components feature polished corners, drawn flanks and rounded visible edges, which reduce friction and provide the movement with enhanced longevity; the screw heads, pivot shanks and pinion faces have also been polished. • In order to guarantee greater component durability, the finishing of the jewels is the subject of particular care and attention: the holes in the 19 jewels used for the gears and escapement are polished, while on the bridge side, the jewels are olive-machined and the mouldings are polished. • The balance spring is fixed by a sliding plate using a balance-spring stud with a round head and neck. This particularly delicate watchmaking operation allows the spring to be centred more precisely and thus for the movement to be adjusted more efficiently. • The weight of the escapement wheel has been reduced in every way possible in order to reduce the impact that its inertia has on the adjustment of the movement. The Cartier 9452 MC calibre is accompanied by a lead seal featuring the official hallmark of the state of Geneva, as well as an individually numbered certificate of origin attesting to the fact that the movement has passed all of the examinations imposed upon it by the Office for the Voluntary Inspection of Watches from Geneva (Bureau de Contrôle Facultatif des Montres de l’État de Genève). 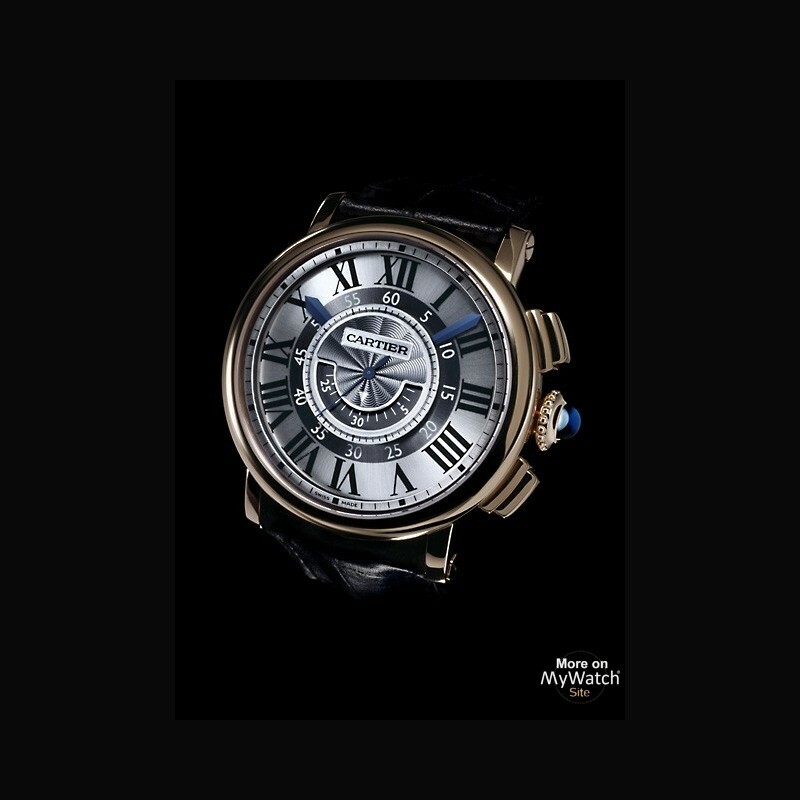 In 2007, the Richemont group acquired the production facilities of the Roger Dubuis Genevan Manufacture along with its 28 exclusive movements. Aside from the La Chaux-de-Fonds site, Cartier now owns workshops in the watchmaking metropolis located on the shores of Lake Léman. The movements manufactured there stand out for the discreet presence of a hallmark bearing the seal of the town, whose origins date back to 1886. In fact, the first law on the voluntary quality control of pocket watches by the Geneva Observatory came into effect on the 6th December of that same year. It also provided the legal basis for the use of the prestigious “Geneva Seal”. Since the 5 April 1957, the regulations have been considerably strengthened. To obtain the Geneva Seal, it then became necessary to observe eleven quality criteria, one of which concerned a precisely defined standard of timekeeping precision. The latest revision of these strict regulations dates from 22 December 1994 and ensures that rigorous testing is carried out – to which the prestigious tourbillon 9452 MC calibre is submitted – under the scrutiny of inspectors from the Watchmaking School of Geneva. The “Office for the Voluntary Inspection of Watches from Geneva” was founded within the walls of this very establishment. The officially sworn-in inspectors have to be Swiss citizens and must not be involved in any professional activities that might result in a conflict of interest. As has always been the case, the organisation only tests mechanical movements that have been assembled and adjusted in the canton of Geneva. The regulations now include twelve criteria related to the quality of the components and their manufacture. The catalogue notably details the fabrication of steel parts, screw heads, stones, toothed gears, axes and pinions. Other instructions address the fixing of the balance spring, the technical fabrication of the oscillating system and escapement, the painstaking craftsmanship invested in the manufacture of winding elements and the adjustment of the hands, as well as the care and attention necessary for the creation of other components.